Unless they're among themselves Conservatives hate talking about two of the worst presidents in U.S. history, Nixon and Bush 43, but they're shameless when it comes to trumpeting the aura of that demented, vicious, ignorant, old man, that "B" Hollywood actor - Ronald Reagan. Talk about putting lipstick on a pig. "If you ever happen to come across a Republican on television these days, chances are that you will hear the name Ronald Reagan. 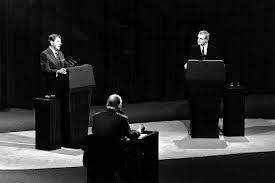 Recent Republican debates are the perfect example of the love fest that the current Republican party has for Reagan as each candidate name drops the former president at every turn. If you only listened to conservatives you would think that Jesus Christ was the only person above Reagan on the totem pole of conservative love. They talk about his love of low taxes, less government and conservative family values. The problem is that when you step out of the conservative dream and come back to reality, you find that not only was Ronald Reagan a bad president, but he was one of the worst presidents we've seen in modern times. 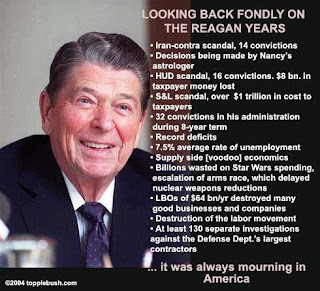 Reagan's policies have destroyed the United States for three decades, and for the eight years he was in office, here are eight reasons why Ronald Reagan was the worst president of our lifetime. Ronald Reagan is loved by conservatives and was loved by big business throughout his presidency and there's a reason for it. When Reagan came into office in January of 1981, the top tax rate was 70%, but when he left office in 1989 the top tax rate was down to only 28%. As Reagan gave the breaks to all his rich friends, there was a lack of revenue coming into the federal government. In order to bring money back into the government, Reagan was forced to raise taxes eleven times throughout his time in office. One example was when he signed into law the Tax Equity and Fiscal Responsibility Act of 1982. Reagan raised taxes seven of the eight years he was in office and the tax increases were felt hardest by the lower and middle class. "As Reagan cut taxes for the wealthy, the government was left with less money to spend. When Reagan came into office the national debt was $900 billion, by the time he left the national debt had tripled to $2.8 trillion. 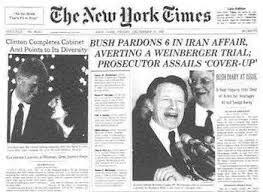 "In 1986, a group of Americans were being held hostage by a terrorist group with ties to Iran. 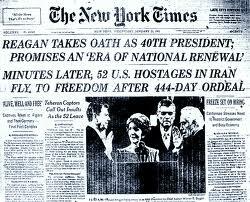 In an attempt to free the hostages, Ronald Reagan secretly sold arms and money to Iran. Much of the money that was received from the trade went to fund the Nicaragua Contra rebels who were in a war with the Sandinista government of Nicaragua. When the scandal broke in the Untied States it became the biggest story in the country, Reagan tried to down play what happened, but never fully recovered. The attacks on 9/11 by al-Qaeda and Osama Bin Laden brought new attention to international terrorism. All of a sudden, Americans coast to coast wore their American flag pins, ate their freedom fries and couldn't wait to go to war with anyone who looked like a Muslim. What Americans didn't realize was that the same group that attacked the United States on 9/11 was funded by Ronald Reagan in the 1980s. Prepping for a possible war with the Soviet Union, Ronald Reagan spent billions of dollars funding the Islamist mujahidin Freedom Fighters in Afghanistan. With billions of American dollars, weapons and training coming their way, the Taliban and Osama Bin Laden took everything they were given and gave it back to the United States over a decade later in the worst possible way imaginable. 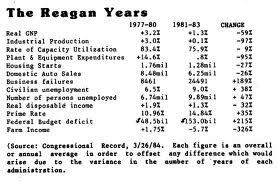 When Ronald Reagan came into office 1981, unemployment was at 7.5%. After Reagan cut taxes for the wealthy, he began raising taxes on the middle and lower class. Corporations started to ship more jobs out of the United States while hiring cheap foreign labor in order to make a bigger profit. While corporations made billions, Americans across the country lost their jobs. 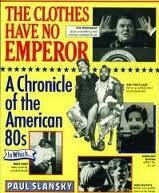 As 1982 came to a close, unemployment was nearly 11%. Unemployment began to drop as the years went on, but the jobs that were created were low paying and barely helped people make ends meet. The middle and lower class had their wages nearly frozen as the top earners saw dramatic increases in salary. "By the time the 1980s came around, AIDS had become one of the most frightening things to happen to the country in recent memory. No one understood what AIDS and HIV really was and when people don't understand something, they become scared of it. The fear of the unknown was sweeping across the country and Americans needed a leader to speak out about this horrible virus, that leader never came. 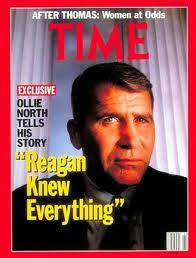 Instead of grabbing the bull by the horns and taking charge, Reagan kept quiet. 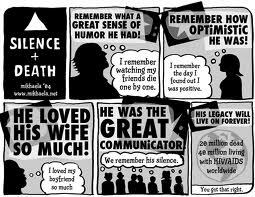 Reagan couldn't say the words AIDS or HIV until seven years into his presidency, a leader not so much. "In today's GOP, the idea of any immigrant staying in the United States whether they are legal or illegal isn't something that conservatives embrace. What might shock them is that in 1982 Ronald Reagan gave nearly 3 million undocumented workers amnesty. The biggest reason for undocumented workers coming to the United States is because corporations hire them at a cheaper rate than they would an American citizen. All the laws that would have cracked down on companies who hire undocumented workers were, of course, removed from the bill. "The Republican war on unions and the middle class has been heating up in states like Wisconsin and Ohio, but it has been going on for a long time. Unions are formed to give a united voice to the workers in an attempt to create fairness between the corporations and their employees. On August 3rd, 1981, PATCO (Professional Air Traffic Controllers Organization) went on strike in an effort to get better pay and safer working conditions. 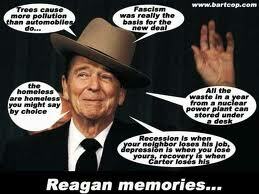 Two days later, taking the side of business, Ronald Reagan fired 11,345 workers for not returning to work." 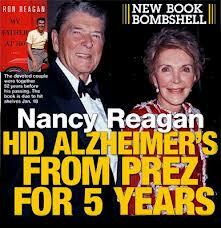 It wasn't hard to believe that Reagan suffered from Alzheimer's when the Nation watched while he fumbled his way through explaining his role in the Iran-Contra scandal on television, managing as the "Teflon President" to lie his way out of culpability by showcasing his dementia, but the fact that voters actually elected him with a record-breaking margin after watching him fumble his way through the debate with Walter Mondale is totally stupefying and will remain an embarrassment to the country forever. When Reagan was incapacitated with Alzheimer's disease for so many years before finally expiring, many took delight in imagining him looking up at his shoe-fetishish second wife Nancy, crying out for his first wife, crying out in delight, "Jane...Jane...is that you?" Schadenfreude. 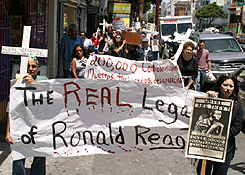 As the attack on labor unions and trickle-down economics helped bring the country to its present state and California to its current shaky state since he was its Governor, the effect of Reagan's presidency on the country still lingers on, just as the effect of laws passed by Congresses controlled by the GOP lingers on to benefit the upper class to the detriment of the 98 percent of the rest of the country. A major action of criminalizing Conservatism will be to repeal any and all laws promulgated by those Congresses, by all of the Conservative-controlled Supreme Courts, as well as by GOP Presidents like one of the most vicious of them all - Ronald Wilson Reagan.